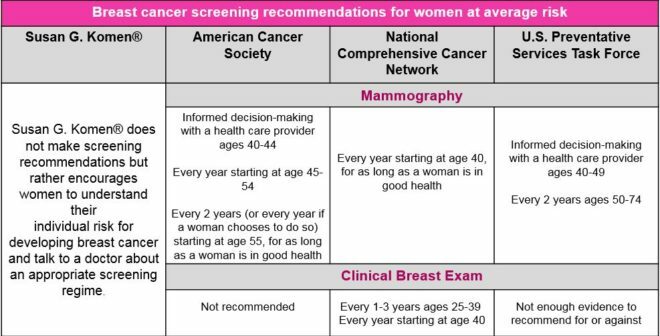 Screening recommendations for women at average risk vary according to age. This chart illustrates the different screening guidelines for those at average risk. Learn more about screening guidelines for women at average risk. Sign up for breast cancer screening reminders. Mammography in women ages 40-49 may save lives, but the benefit is less than for older women. Individual study findings vary. Breast cancers in younger women tend to grow faster than breast cancers in older women. This means mammography every 1-2 years may be less likely to catch breast cancer early in younger women, when the chances of survival are highest. Screening guidelines for women at average risk vary by organization due to the process in which results are studied. Some organizations put weight on different factors related to the benefits and drawbacks of receiving mammography before age 50. The important thing to note about screening guidelines is that all organizations recommend a woman understand her individual risk of getting breast cancer and follow appropriate screening guidelines as recommended by their doctor. For women ages 50 – 69, the life-saving benefits of mammography are clear. Women ages 50-69 should have mammograms on an annual basis. Breast cancer risk increases with age, and mammography does not appear to be less effective in women 70 and older. However, there are few studies on the benefits of mammography in women ages 70 and older, and none of these have been randomized controlled trials. Some women may stop routine breast cancer screening due to poor health. Women who have a serious health problem may not benefit enough from having breast cancer found early to justify screening. However, women who are in good health and could benefit from treatment (if breast cancer is found) should continue to get mammograms. Learn more about the benefits and risks of mammography.